Avery Jones, 19, stood on the steps of Legislative Hall in Dover and spoke about the fear young Americans feel in the age of mass shootings. 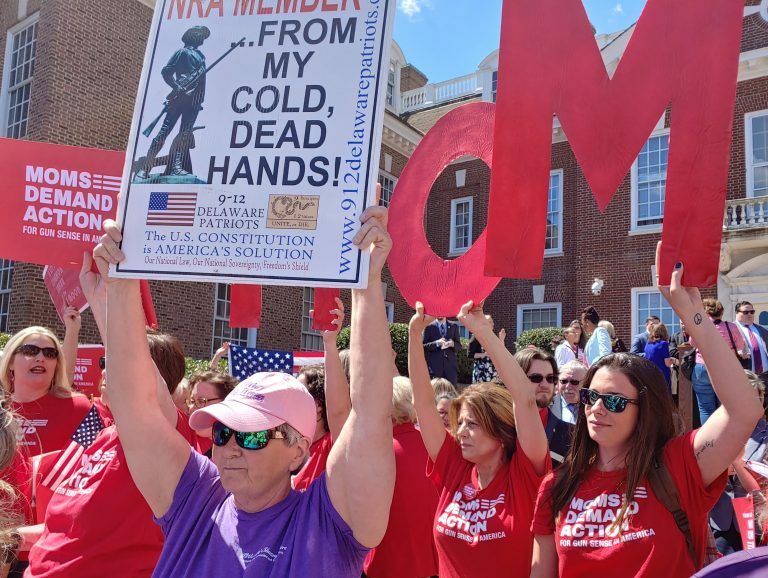 But the University of Delaware freshman was brought to tears as a large group of gun rights advocates booed loudly. 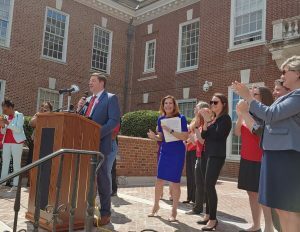 Jones and other activists, including those from Moms Demand Action, joined Democratic lawmakers Wednesday to announce three pieces of anti-gun violence legislation. The proposed measures aim to eliminate the sale and import of assault-style weapons; eliminate the sale of magazines that hold more than 15 rounds; and require prospective gun buyers to get a permit from the state’s Department of Safety and Homeland Security before they can purchase one. Bill sponsor state Sen. Bryan Townsend, D-Newark, attempted to discuss the need for the bills. But his voice was drowned out by shouts of “Traitor!” and “Townsend’s got to go!” Police officers watched the agitated crowd. 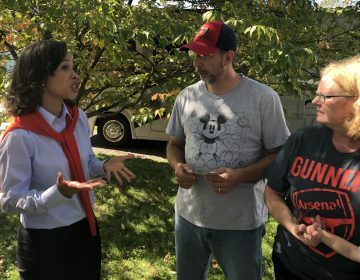 Supporters of the bills say the changes will help prevent mass shootings and keep guns out of the hands of criminals. Studies show the U.S. has more mass shootings than any other country. About half have involved high-capacity magazines, and semi-automatic rifles were used in several of the deadliest mass shootings. 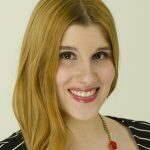 “Combating gun violence isn’t an urgent need for any one part of our community — it is an urgent need for everyone in our state, from our streets to our schools to our houses of worship and workplaces,” said LGBTQ activist Sarah McBride. Pike Creek resident Megin O’Donnell of Moms Demand Action survived the 2017 mass shooting in Las Vegas. During the event, she described the fear she and her friends felt as they fled, eventually hiding in a hangar in the nearby McCarran International Airport. “What I remember most honestly is the silence and faces of the people around us. It was such an overwhelming moment. I think the high-capacity magazines is personal [for me] because that is what happened in Las Vegas, and I know if he had to take two or three seconds to reload, it would have saved lives,” O’Donnell said. 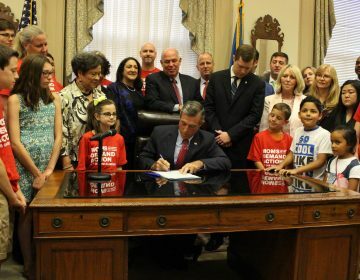 The ban on assault-style weapons would prohibit the sale of about 60 guns in Delaware, including AK-47s, AR-15s and UZIs. 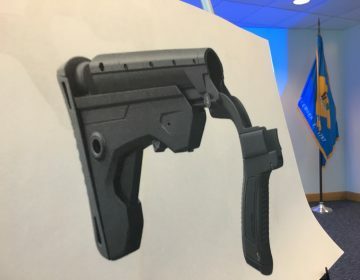 The bill would exclude police and military personnel, and also grandfather in those who currently legally own this kind of firearm. Those grandfathered in could obtain a voluntary certificate proving they’re legally allowed the firearm. The legislation aiming to ban the sale of high-capacity magazines focuses on those capable of holding more than 15 rounds. The bill would create a buyback program giving owners until June 2020 to hand them over. 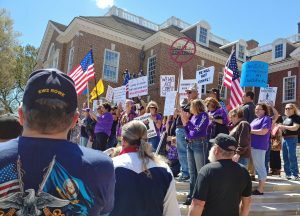 The legislation requiring a permit from the state mirrors similar efforts in other states, including New Jersey. Applicants would be required to complete a firearm training course, submit information similar to what can be found on a driver’s license and have their fingerprints run through state and federal criminal databases. The information would be reported to law enforcement to streamline the process of investigating gun crimes. Kathleen Lodge Brannan of Newark and other demonstrators said they believe their Second Amendment rights are being taken away. Townsend said the protesters were disrespectful, and he said he was disappointed they chose to chant instead of listen to the speakers. Mitchell Denhem, one of the protest organizers, said his group needed to be heard. He believes lawmakers should instead focus on tough-on-crime laws and measures to address mental health. Last year, a similar assault weapons bill sponsored by Townsend was got stuck in committee. However, this year President Pro Tempore David McBride, D-Hawk’s Nest, vowed to bring it to the Senate Executive Committee for a hearing and advance it to a vote on the Senate floor. Townsend said he believes now is the right time for this legislation, which he said was drafted with the concerns of responsible gun owners in mind. “I think senators, in part because there’s been some change over in members of the Senate, in part because of gun issues on the campaign trail and just in general — it’s sad it takes more and more tragedies week after week or month after month for people to see. Even last year I had Republican colleagues standing up saying, ‘I support background checks,’ well if you go back five or six years previous to that and look at their voting record, they didn’t vote for universal background checks,” he said. The buyback events are set for Saturday, Nov. 4, from 10 a.m. to 2 p.m. and Nov. 7, from 4 to 8 p.m.
With the fervor of a preacher, U.S. Rep. Lisa Blunt Rochester pumped up a group of Democratic women candidates and office holders on a recent Saturday morning.